Wearing skull bracelets could be a new fashion trend among the modern men. MENSSKULL Jewelry brings silver skull bracelets in a variety of designs that can appeal to all men customers from around the world. 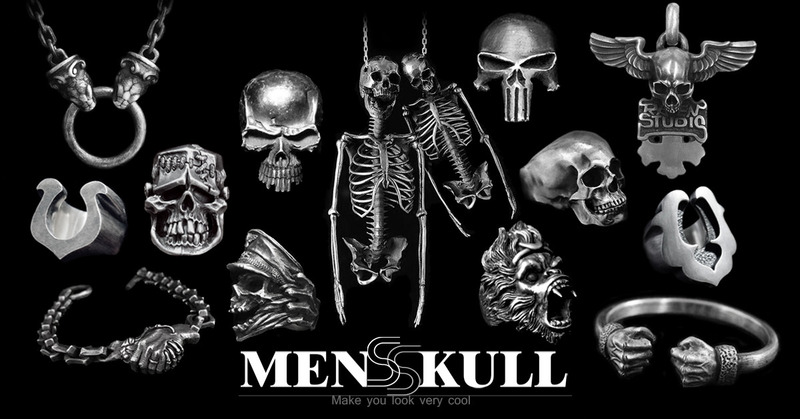 With their amazing range of skull jewelry, MENSSKULL Jewelry aims at setting a new trend in the men’s fashion circuit. The online jewelry store has an amazing collection of skull rings, skull bracelets, skull pendants and skull necklaces, all made from the finest quality silver. The silver bracelet with skull shapes could be highly attractive and could be a new fashion accessory for the most men on this earth. One can choose from a number of bracelet designs and can pick the best skull shape bracelet that can match his personal style. The spokesperson of the online jewelry store invites all men to explore their astounding skull bracelet collection that features beautiful as well as scary designs, such as glory bracelet for men, silver top edge bracelet, skull cowhide bracelet, large bone bracelet, nail bracelet, horseshoe bracelet, and other styles. All these bracelets are unique from the designing point of view and showcase an outstanding craftsmanship. The spokesperson states that they have a team of an experienced designers and craftsmen who are capable of designing a wide range of bracelets due to their sheer imagination and hard work. These dedicated designers keep introducing new skull jewelry designs to make the collection exhaustive and remarkable. The online jewelry store presents an extensive Men’s bracelet collection, which includes bracelets for men of all tastes and style preferences. Each bracelet is handmade and features a robust built, allowing men to wear them all the time, while playing, exercising, swimming or biking. These bracelets are designed to perfection with a matchless grinding and a flawless polishing. This is the reason why the shine of these silver bracelets never fades away, even if these are exposed to the environmental elements of rain, sun, dust and others. Designed for the long-lasting use, these men’s silver bracelets could be a man’s all-weather friend and can keep adding to his fashion quotient without a fail. According to the spokesperson, they always use high quality silver in making their skull jewelry. They design the silver bracelet for men, keeping in mind the changing fashion trends of the modern times. This is the reason why one can always find innovative silver bracelets in their collection. The designers carve out the bracelet designs from the given manuscript and work dedicatedly to maintain the freshness and uniqueness of the designs. They have bracelets in varied sizes in their collection and can also provide custom-size bracelets that can be ideal for a man to wear and flaunt his style. Since each bracelet is prepared through the manual process, it may take several days to produce just one bracelet. Customers can browse through MENSSKULL Jewelry’s exceptional skull bracelets by visiting the website https://www.mensskull.com. MENSSKULL JEWELRY was founded in 2014, offering online self-service shopping of silver skull jewelry. They have the world’s best team of designers, who can design ingenious jewelry items. With more than ten years of manual production skills, each designer’s work is unique. MENSSKULL JEWELRY has an extensive collection of hand carved and coolest jewelry for customers.